Despite its sting, nettle is rich in both nutrients and medicinal benefits. Explore this healing herb's history, uses, and more. Nettle, an herb originally found growing in Europe, Asia, North America, and Africa, has been a popular source for natural teas and hot drinks for centuries. Nettle has been used by humans for various purposes for as long as 5,000 years, and it is first known to have been cultivated as a crop in Europe. Nettle still grows wild throughout the world, and its many health benefits make it a useful herbal remedy. Relieving symptoms of allergies. Antihistamines found in nettles are helpful in reducing and alleviating allergic reactions, from stuffy noses to skin irritation. Reducing inflammation and irritation. Compounds in nettle allow it to reduce swelling, both externally and internally. Additionally, nettle's diuretic properties are especially useful for those suffering from low urinary flow due to an enlarged prostate. Different parts of the nettle plant possess different medicinal uses. 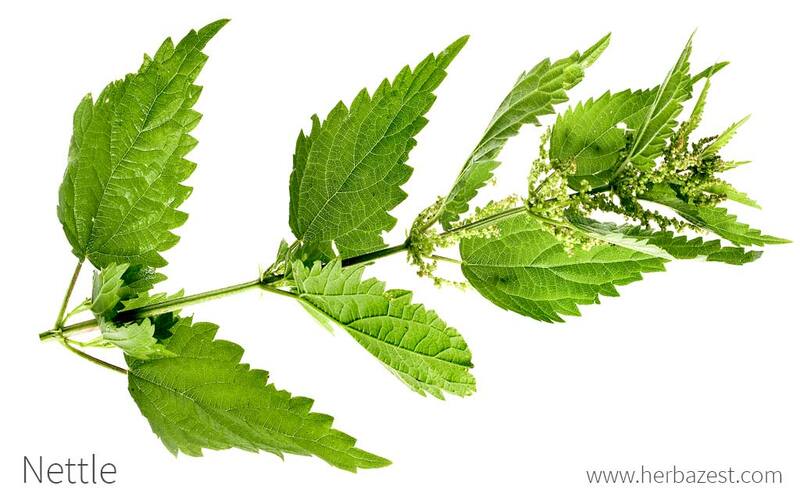 The nettle leaves contain natural antihistamines, which enable it to reduce the symptoms caused by allergic reactions by inhibiting histamines - the cause of allergic reactions - in the body. Leaves also contain flavonoids, compounds that help to reduce inflammation in the body. Nettle roots contain phenols, which are also anti-inflammatory and can reduce swelling both on the skin and internally. However, nettle root also appears to be responsible for improving the urinary symptoms associated with benign prostatic hyperplasia, or an enlarged prostate. The mechanism of this action is not yet entirely understood, but the effect has been observed in studies. Greater plantain is an herb that also hold anti-inflammatory properties, and saw palmetto is popularly used for treating the symptoms of benign prostatic hyperplasia (BPH). Nettle is considered safe if taken in recommended doses. It may cause some mild side effects, including stomach upset, fluid retention, sweating, and diarrhea, as well as possibly causing a rash if used topically. Nettle may interact with blood thinners, blood pressure medication, diuretics, diabetes medications, lithium, and non-steroidal anti-inflammatory drugs (NSAIDs) like ibuprofen or aspirin. Nettle is not recommended for use for those who are diabetic or for those who are pregnant or breastfeeding. Do not use nettle to treat an enlarged prostate without first visiting a doctor to rule out life-threatening underlying causes of the condition. Nettle is known for causing a painful sting when touched, as chemicals contained in the fine hairs on the leaves and stem are irritating to human skin. Use caution when coming into contact with the plant in the wild or in the garden. Soaking nettles in water or exposing them to heat helps to remove its ability to sting. Nettle has a long history of use as a culinary ingredient. It has a flavor said to be similar to spinach or cucumber, and can be added to a number of different meals such as soups and pastas. However, nettle is most commonly used as a remedy. Infusion. Made from fresh or dried leaves, one cup of nettle tea can be taken daily to relieve allergies and to reduce joint inflammation. Decoction. This preparation is obtained by boiling nettle roots, and can be used to reduce inflammation in joints, as well as to increase urination, particularly for those with enlarged prostates. Ointment. Nettle ointment is best for relieving skin inflammation and irritation, both from allergic reactions and from other conditions. Tincture. One teaspoon of nettle tincture can be diluted in half a cup of water and taken twice a day, or applied topically to alleviate skin conditions characterized by inflammation. Capsules. Nettle capsules can reduce inflammation, especially in joints, and may also promote urination. Because nettles are not grown commercially, finding fresh or even dried nettle leaves and roots is very difficult. In some cases, they may be available at local markets or online retailers, but the seeds to grow the plant are more readily available, both online and at gardening centers. Nettle supplements may be available in certain grocery stores or local markets - especially in tea form - but they are likely to be most readily available at herbal shops and online. When buying supplements, take care to note whether the preparation was made from the leaves or the roots, since the different parts of the plant have different uses. Nettle is considered an invasive weed in many parts of the world, which makes it a simple plant to grow in the garden. It tends to develop well on its own without any intervention if planted in the right conditions. Nettle should not be planted in any place where children, or other unsuspecting visitors, might be stung. Both seeds and cuttings are viable methods of propagation for nettles. If using seeds, they should be stratified before planting and it may be helpful to start the plants in pots indoors for the first few weeks. Rich, moist soil is the best type of soil for nettle. Moisture is especially important for nettle, and the soil around the plant should not be allowed to dry out. Soil with a range of pH levels can support nettle growth; the plant will thrive in both acidic and alkaline soil, with pH levels ranging from 5.5 - 8.5. Nettle should be planted in full sun to partial shade. Nitrogen fertilizer will help encourage nettle to grow. Nettle is not susceptible to many pests or diseases, and can even help discourage deer and other animals from eating nearby garden plants. The plant is considered invasive, so should be monitored to ensure it does not take over a garden. A perennial herb, nettle generally grows up to five feet (1.5 m) tall. Its leaves are lance-shaped, one to six inches (3 - 15 cm) long, and are covered in tiny, stinging hairs. Nettle grows small green and yellow flowers that bloom in the summer. Nettle may also be called stinging nettle, burn nettle, burn weed, and burn hazel. The nettle, or Urtica dioica, is a member of the Urticaceae family, which contains around 2,600 species. Most of the species in this family have stinging hairs, and members are found on every continent aside from Antarctica. The nettle has at least five subspecies: U. dioica subsp. dioica, U. dioica subsp. afghanica, U. dioica subsp. gansuensis, U. dioica subsp. gracilis, and U. dioica subsp. holosericea. U. dioica subsp. diocia is the most common subspecies in Europe, while U. dioica subspecies gracilis is the most common in North America. Only one subspecies, U. dioica subsp. galeopsifolia, does not have stinging hairs. The first documented uses of nettle date back to the Bronze Age, in 3,000 - 2,000 BCE, when it was used to create woven textiles, such as burial shrouds, and clothing in Denmark. However, the first records of medicinal applications of nettle appeared in ancient Egypt, and these applications were adopted by both the Greek Mycenaean civilization and the Roman Empire. By the 16th century, nettle was being used as an antidote for poison in England, and in the 1800s, it began being marketed as a diuretic and tonic. Nettle is not commonly used outside of herbal remedies, and so it is not considered an economically important plant. It has been produced commercially in the past, but is now grown mostly by individual gardeners for their own use. It is still grown for and sold in medicinal preparations, but this use does not constitute much economic importance. Nettles growing in North America were an important part of mythology for many Native American tribes. Often, stinging nettles were personified as bumbling tricksters who provided a humorous note to the myths. Nettles are also the subject of several different festivals and competitions. One festival in Switzerland hosts a number of restaurant dishes prepared using nettles, while another in Russia takes the nettle as its theme for the nettle's association with love of life, vitality, and strength. Marshwood, a town in England, holds a competition to see who can eat the largest amount of raw stinging nettles - a painful endeavor. Textiles. The fibers from nettle stems can be used to make textiles, and they have historically been used to make clothing as well as other items such as fishing nets and ropes. Dye. Nettle has also been used to produce yellow or green dye. Beer. Nettle leaves have also been used to ferment beer. Despite nettle's sharp sting, it can be a very useful medicinal herb when handled with the proper caution. For those needing alleviation from allergies, inflammation, or urinary problems, nettle is a valuable herbal remedy.